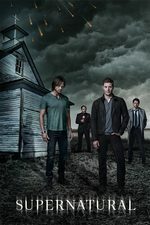 Sam, Dean, and Castiel continue to search for a way to open a breach; one of their own may be working against them and costing them precious time. I felt like the first part of the imdb episode summary was a tad spoiler-y for the ep, so I cut it out: "Jack and Mary escape Michael's clutches and end up finding an ally in Bobby Singer." - Jack making his shadow puppets was so cute. Also, "Sam and Dean, they wouldn't run away"
- Dean and Castiel having a heart to heart about how Cas is doing. - "I don't get words wrong" and Dean's eye roll response. "I'll kill the pretty one"
"I hate doing this. You are very beautiful"
- "Ask them about the loincloths"
I like to imagine some alternate universe where Gog and Magog decide to help team free will, and they follow Cas and Dean back to the bunker and hilarity ensues. So, what do you guys think of Cas's actions in this episode? I wouldn't mind too much if this is a sort of return to "good soldier" Cas of season 4, but I really hope this isn't going to be a re-tread of season 6 Cas. Although in this particular case, I'm pretty sympathetic to his perspective. What exactly were they planning to do with Donatello if Cas hadn't stepped in? I get that killing him would have sucked, and him being brain dead isn't much better, but he's secretly working for Asmodeus, has no soul, and apparently has been corrupted by the demon tablet, and they won't get another prophet while he's alive. Also, how long are they going to make us wait for more Gabriel? I was really hoping for a follow up in this episode, but it figures they would make us wait a while before delivering on the previous episode's reveal. So, what do you guys think of Cas's actions in this episode? I thought 'give Donatello a clean death' was the least-worst option they had available, and would've preferred that over what happened. I do think Cas was right that they could neither help him nor properly contain him though. In the early days of this show, I used to tell people it was kind of like X-Files crossed with Buffy. And it was! These two guys would wander around in the Canadian woods taking out horrible monsters, and it was all very MOW X-File-y but with Whedon-ish quips. As it went on it became very much its own thing, but in those early days you could see the influences pretty clearly. I hadn't thought about that for years, but something about Gog and Magog struck me as so Whedon-y, and specifically so Angel-y. These two hulking, mystical warriors who are intimidating but also speak in a kind of modern, funny way, and keep interrupting the battle to argue about which of the boys is prettier. I could SO picture Angel's gang going up against those two! i mean, most of the angels are still alienating assholes, or as-greedy-and-self-serving-as-human assholes, or just whimpering cowards. Cas is the most human-like morally ok angel so far, and i think hunters like Sam and Dean would rather have that on their side at this point, disregarding sentiments.